By Professor Sir Gordon Conway and Professor Jeff Waage, with Sara Delaney. Published by UKCDS January 2010. 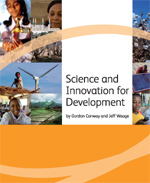 Hard copies will be provided free of charge to researchers and policy-makers in developing countries (see above link).